Unfortunately construction site accidents happen much too frequently in Massachusetts. These accidents result in serious injuries, and even death. Sometimes injured construction workers don’t know where to go for help. Depending on the type of construction accident, it is important to target exactly what caused your accident, who is responsible, and all sources of available insurance coverages to pursue. Boston construction accident lawyer Christopher Earley can help you navigate this process. During two summers in college, he worked on construction sites, and got a first-hand look at how dangerous construction work can be. Those who work on construction sites, such as carpenters, electricians, plumbers, crane operators, laborers and others, are exposed to the risk of personal injury each and every day around a construction site. If even the slightest safety measure is not followed, very serious injuries can result. Even those not working at the site such as pedestrians in the area of the site can sustain serious personal injuries from falling objects or collapses. Unlike other accident cases, Massachusetts construction site accidents present unique challenges. The reason is that they can encompass different areas of law such as negligence, strict liability, and workers’ compensation law. Federal law also comes into play in with these cases as well. There are many safety rules that all employers, contractors, sub-contractors, building owners, and equipment manufacturers, and providers, must strictly follow. What Are Common Causes of Construction Site Accidents? Due to the size and scope of most construction sites, there are so many things that can go wrong. No matter how careful the injured worker is, he/she is constantly exposed to on-the-job injuries. 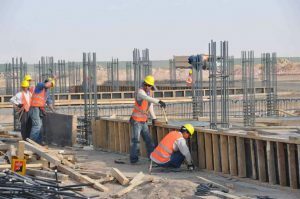 Employers and contractors in the construction field commonly chose saving money over property safeguarding a construction site. Inevitably, things go wrong. And when things do go wrong, it is common for construction workers to become seriously injured. Basic and required safety measures and accident-required safety guidelines are oftentimes ignored. This results in hard-working and innocent construction becoming injured due to no fault of their own. What Are Common Injuries On A Construction Site? How Can A Construction Site Accident Attorney Help Me? As a Boston personal injury lawyer, part of my job is finding out what went wrong that led to your accident. I also investigate who is responsible. General contractors, sub-contractors, and building owners are the parties that can be held responsible for your injuries. The key with these cases is prompt investigation so that all evidence is preserved, and all available parties can be pursued. That allows us to pinpoint which insurance policies are in play for the injured worker to collect on. Injured construction workers typically have both a workers compensation, and third-party liability claims that can be pursued. Which Construction Workers Do You Help That Have Been Injured? Construction accident cases in Massachusetts always involve workers compensation claims . That is because when construction site employees are injured, regardless of how the accident happened, they are entitled to workers compensation benefits. These benefits only apply to employees, and not independent contractors. Workers comp benefits pay you for lost time from work, medical bills, as well as other benefits. If you are temporarily, totally disabled from working, you can have your medical bills paid, and 60% of your gross wages paid as well. You can collect these lost wage benefits for up to 3 years. If you are temporarily, partially disabled, you may collect 75% of your temporary partial rate of pay, for up to 4 years. For disputes that arise between injured workers and workers compensation insurance companies, the Department of Industrial Accidents is the proper court. This Court decides whether you are entitled to Massachusetts workers compensation benefits, or whether the insurance company can reduce, or terminate your benefits. If you are hurt at the job site, you cannot sue your employer. The only remedy you have against your employer is for workers compensation benefits. However, if your injuries arose due to the fault of any other party, such as a contractor, sub-contractor, etc., then you may bring a claim against that party. These are called third-party claims and can be brought in either District or Superior Court. These are negligence claims and they have three-year statutes of limitations. If a settlement is reached for a third-party clam, the injured worker must pay back the workers compensation insurance that paid him his benefits. This is because the insurance company has an automatic lien against the settlement. This is addressed at MGL 152, Section 15. However, this lien is as a matter of law reduced by 1/3 because you have legal fees and costs to pay as well. A Section 15 petition must be filed and approved by either an administrative law judge at the Department of Industrial Accidents, or, by a judge at a Massachusetts Superior Court. Read our reviews and call us if you need help. We are a Boston construction accident law firm that can help you during this difficult time. We offer guaranteed, free consultations and we only get paid if we win your case. We also will visit you if you are unable to come to our office in downtown Boston. Call today. We are easy to talk to. Experienced law firm that fought for my case. They were always updating me on follow ups right up to the time my case was settled. I felt like I was always in the loop as they were available to answer any questions I had . Other firms gave me the run around and just left me confused. With these guys it was very professionally communicated every step of the way. Highly Recommend! Honest, trustworthy and compassionate are words that truly describe Chris Earley. From the first time we spoke my husband and I were sure we wanted to work with him. He made the process effortless for us and always kept us "in the loop" regard the details of my case. I highly recommend Chris! Chris is genuine. As an attorney, he is very patient, courteous and professional. He and his firm always respond to inquiries, immediately. I am completely satisfied and so thankful I have been referred to Chris. He's the type of guy that gets right back to you when you need him or have a question. A real fighter too. All the best qualities on your side. 5 stars!